Celeste and Tom Revelli pose for a photo at Urban Village Brewing, located at 1001 N 2nd Street Philadelphia, PA. Sunday, March 17, 2019. 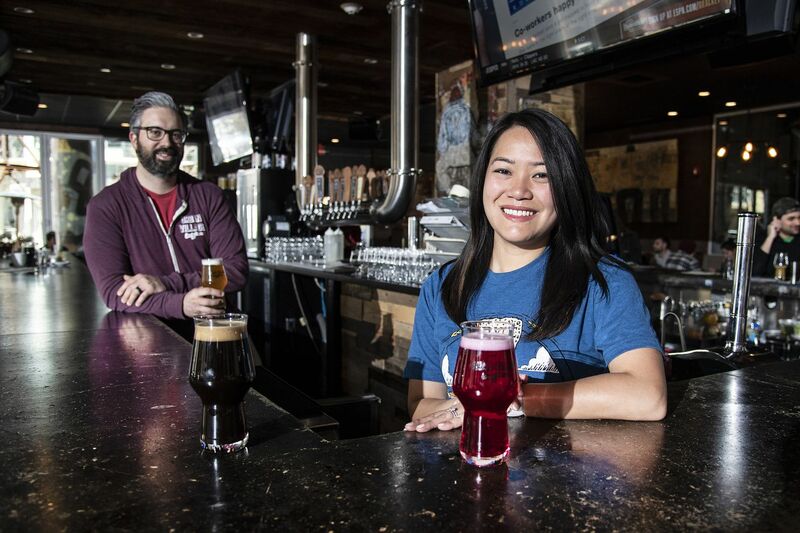 The Revelli's managed to pay down six figures in student debt and get married, while Tom opened Urban Village brewery with a co-owner. Celeste works as director of financial planning at eMoney Advisor. It’s the first day of spring! Nicer weather and flowers are headed our way but, most importantly, it’s time for free water ice and ice cream. It’s also a time of new beginnings, which makes our top story this morning thematic and inspiring: a Philly couple is sharing their finance tips after paying off $150,000 in student loans. Now that’s a fresh start many a millennial would enjoy. Sadly today is not one of starts but one of ends for Temple University: their NCAA Tournament dreams were dashed last night, marking the end of an era for the basketball team. When Celeste Hernandez Revelli graduated from Loyola University she left with $90,000 in debt. When she met her husband, Tom Revelli, he had $60,000 in loans from the Art Institute of Philadelphia. Now she’s helps others navigate their finances and he opened a brewery in Northern Liberties with a partner. Oh, and they’ve nearly paid off all those loans ahead of schedule. So, how’d they do it? It’s no mystery: they’re sharing all the lessons they learned with you. Temple’s short NCAA Tournament run is over. The Owls lost a play-in game to Belmont University 81-70 last night, thus ending the Temple career of legendary coach Fran Dunphy, who spent 13 seasons at the school. But there’s still one more local team in the race: Villanova joins all the March Madness tomorrow night against St. Mary’s, and they’ll be relying on the leadership of seniors Phil Booth and Eric Paschall. If you can’t wait that long to watch some Philly basketball, tune into the Sixers’ showdown with the Celtics tonight. It was a challenging day for the Philadelphia Board of Elections. The deadline for filing legal challenges to primary election candidates’ nomination papers was 5 p.m. Tuesday and the office literally had to call for backup. Council President Darrell Clarke is among the many candidates who face disputes over the papers they’ve submitted to get on the ballot. One candidate even filed to block 30 of the 33 other Democrats against whom he’s running. At least one candidate for Common Pleas and Municipal Court judgeship dropped out Tuesday after a political consultant allegedly botched several petitions for candidates. After 24 years as head basketball coach, Phil Martelli has been fired by St. Joseph’s, the school announced Tuesday. St. Joe’s athletic director called it the hardest decision of her life. A Roxborough native and former Roman Catholic bishop was accused of “knowingly employing pedophiles” by West Virginia’s attorney general Tuesday. The Pennsylvania Inspector General is launching an investigation into why child abuse and cover-ups went on for decades at the Glen Mills Schools following an Inquirer investigation into the Delaware County campus. Last Thursday, a West Philly grocer survived an armed robbery of his store by inches after engaging in a deadly shootout with the masked robber. A South Jersey man, on trial in the stabbing death of a man moments after the Eagles’ Super Bowl win, testified Tuesday that the episode began with an obscenity hurled at the team by a Cowboys fan. In one of the first, if not the first, public events held by any of the Democratic presidential candidates in Pennsylvania this election cycle, Beto O’Rourke spent time in State College Tuesday. The man in the maze. The word “iconic” comes to mind here, @kylehuff. The good news? The Flyers will play their first game in Europe next season. The bad news? The Flyers lost to the Canadiens last night, missing a chance to up their odds of a playoff berth in the process. Sorry, Phillies fans (and Bryce Harper), it looks like Mike Trout won’t be playing for Philly any time soon. He’s signing a $430 million extension with the Angels. Philly THC is not your normal church. It’s part gift shop, part head shop, and part safe space for medical marijuana patients to take medicines socially. You may have passed the Athenaeum of Philadelphia if you’ve strolled around Washington Square, but if you wander inside the hidden gem you’ll find artifacts from Napoleon and Philly history. Want to meet new friends in your own kitchen? Then coliving, a trend that could be coming to Philly where tenants share common areas, may be right for you. Philly is full of urban farms and gardens, some tilled on vacant land or created by a few neighbors banding together. Now the city wants to support them with a citywide agriculture plan. “Far too many women in the prime of their life are deferring pregnancy because they can’t make the financial sacrifice. They need to know — in the make-or-break moment of their careers — that their job will still be there after they’ve spent time with their newborn. They also need to know that child care costs won’t bankrupt them once they do return to work.” — Conservative political talk show host Rose Tennent on why Pennsylvanians shouldn’t have to choose between having kids and being comfortable. Why do some parents spend so much to get their kids into college? Because it’s about so much more than getting a degree, writes Farah Jimenez, president and CEO of the Philadelphia Education Fund. When a black person repeats the false claims of racists, white supremacy wins, making black sellouts a danger to African Americans, religious minorities and others, writes author and Praise 107.9 HD2 host Solomon Jones. A new study on what happened when Philly closed 30 of its schools, as reported by WHYY, returned results that may be surprising, including who struggled most during the tumultuous time. Billy Penn has mapped Sixers power forward Mike Scott’s courtside sip of a fan’s drink among Philly’s wildest moments and it makes for a lovely trip down memory lane. Celebrate Isaiah Zagar, Philly’s mosaic artist extraordinaire who marked his 80th birthday this week, with Curbed Philly’s map of his most essential artworks around town. Learn the power of the giving circle, the way women are finding ways to give back and make change, via Refinery29. It may just inspire you to start your own. If you’ve used a mobile app to track menstruation or fertility, you’ll want to dive into The Ringer’s look at who “femtech” really benefits, users or the companies who market them. Want to learn about feminism and make some new friends? A book club in Cherry Hill is gathering women of all ages and backgrounds for quarterly chats.